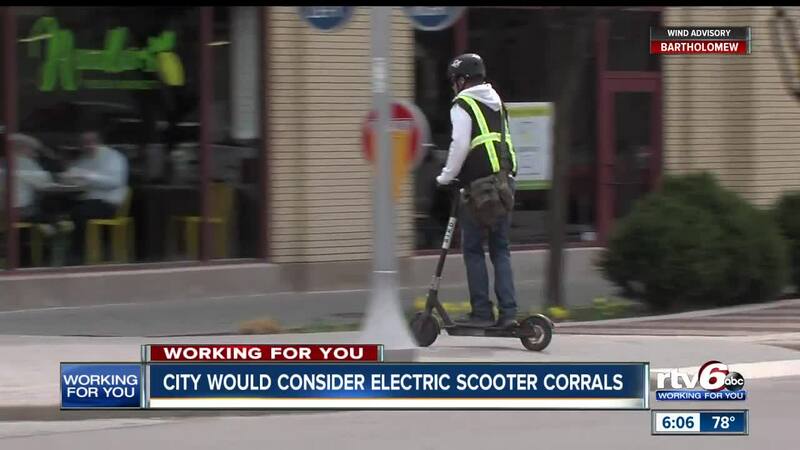 City would consider electric scooter corrals. INDIANAPOLIS — With plans for a new scooter company to start operations in Indianapolis, the city is starting to work on a new plan for parking scooters. Spin is coming to the Circle City in the next month. Bird and Lime scooter companies already require users to park scooters on the sidewalk in an orderly fashion. However, many times these scooters are sprawled all over the sidewalk by riders who don't take the time and effort to follow the rules. Judy Perrin must get around town in a wheelchair, and she said her path is often blocked by scooters. "I've actually said, 'Ma'am or sir, if you're parking that in the middle of the sidewalk, I can't get by. Can you move them back please?' Perrin said. "Some of them actually move them back and some of them tell me rudely where to go." Santa Monica, Calif. addressed this issue by creating electric scooter pens or corrals. The Department of Business and Neighborhoods that oversees scooters in Indianapolis might consider that approach. There will be a board meeting to discuss scooter rules and regulations in May or June.